What do we have here? British filmmaker Ben Wheatley has had a very eclectic, but fascinating career. He started out with the crime comedy Down Terrace, followed it up with the insane cult horror Kill List, and brought us the caravan comedy Sightseers this year. He's already at work directing his next film, something called A Field in England, another extremely interesting story, this one set during the English Civil War (during the 1600s). It's about a group of deserters hunting for hidden treasure in a field who come across mushrooms and things get crazy. I don't believe this B&W photo represents how trippy this film might be. Follows a small group of deserters fleeing from a raging battle through an overgrown field. As they are captured by O'Neil, an alchemist, they are forced to aid him in his search to find a hidden treasure he believes is buried in the field. Crossing a vast mushroom circle, which provides their first meal, the group quickly descends into a chaos of arguments, fighting and paranoia, and, as it becomes clear the treasure might be something other than gold, they slowly become victim to the terrifying energies inside the field. Say what? 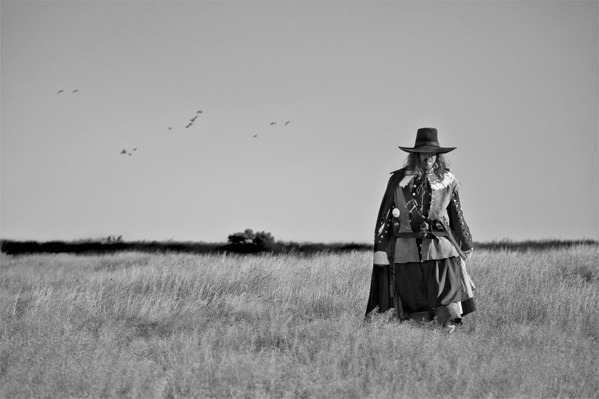 Mushrooms and alchemists and English Civil War deserters? This is why I love Ben Wheatley as a filmmaker. Who actually goes out and makes movies this insane to begin with? Not many. I really want to see this, even though I have no idea what we'll be getting into. I'll keep you updated on A Field in England. Haha, seeing just the header image I was thinking of Solomon Kane or whatever the hell that movie was called. I think this dude is one of the best. Loved Kill List and Down Terrace.